I need some help. 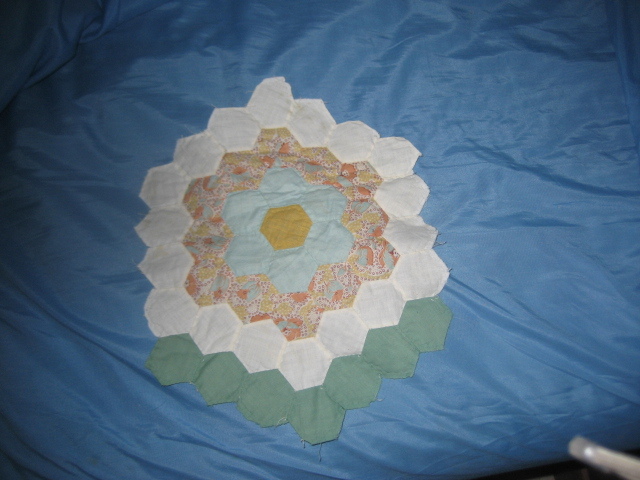 I have a GFGarden, I've been hand quilting on. I'm 98% of haveing it done. The problem I have is, I've got one of the flowers/hexagons. I've had to do some minor zig-zag stitching to some of the hex's. I've got the center, and the 2rows around, the center. The 3rd row out I've had to do some minor zig-zag-9 of the 12 hex's. I have a peice I can cut down, to cover the zig-zag's. Give me some pointers, on what to do, or how to fix. I have this ideal in my head, but not sure of, Take apart the section, I need, and do a very small zig-zag, on the outside edge. And then working inward, do a stitch in the ditch, on the other hex's. I hope to post 2 pictures You may be able to see the zig-zag I had to do. I only need the center, and the 2 rows around to replace/repair. Thanks for any help or suggestions. The 1st picture (the 3rd row) is what need to be fixed/repaired. I'm a little confused. Are the light blue lines on Photo #1 just markings that will come off or are they permanent? Very pretty quilt, Don, but I'm confused by the question, so can't help. Is this an old quilt? It appears someone has replaced two pieces with a similar fabric. 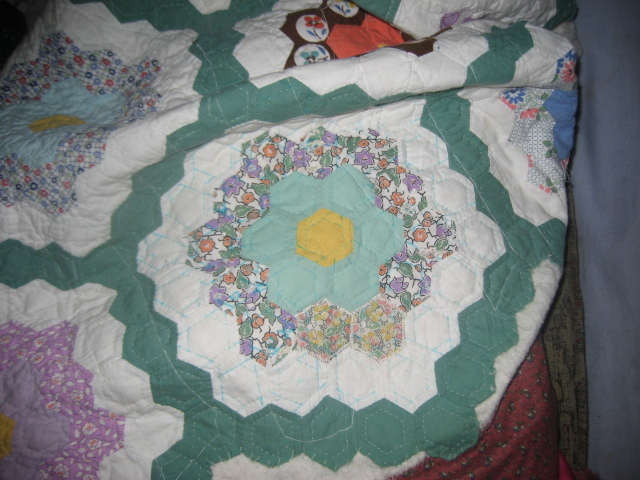 If you can find some of the original fabric, then the repair that would please you most is to open the quilt and replace those two hexagons. If you don't want to go to all that trouble, then I don't see how you can hide the zig zag stitches. Perhaps "applique" some new hexagons over the zig zag ones. Ok, I see that now. I never even noticed that those pieces were different. I think it adds to the charm of an old quilt to leave as is. If it's just the zig zag stitches, they wouldn't be noticeable as you look at the whole quilt. Just keep going with the hand quilting and it will be fine.